The new kid on the block is Gino’s Handmade Italian Gelato which can be found right in the middle of the bustle of Grafton Street, Dublin 2. This company is a little bit of a mystery to me and the girls in the shop didn’t have an amazing amount of English so I have been left less than 100% about the food allergy situation. Anyway, After a bit of confusion regarding the term ‘dairy free’ I was asking the second server, who had a better grasp on what I was looking for, if the gelati was dairy free, gluten free and/or egg free... she said yes to all (and volunteered thats it's vegetarian) after reading some tubs of ‘flavour/mix’? – Now is when I start to doubt – I wonder does the container state the information clearly in a warning label or is she looking for the exact words ‘gluten’ or ‘egg’ in the ingredient list and not thinking of derivatives… I ask if I could read the container but she doesn’t seem to understand my meaning/desire. Next in Doubting Central, I try to find a website which might contain some clear information. I can’t find anything for the Dublin branch. I find a UK website with very different graphics, and a separate facebook page so I think that ‘Gino, The Art of Gelato’ is a separate company which a suspiciously similar name. I continue to comb through the web only to find that traditional ‘yellow’ toned gelato contains egg yolks as it is made with a custard base and while we’re talking traditional recipes, there is also usually butterfat included... hmmmm. Finally, just for added frustration, the Dublin Gino’s facebook page lists the website: www.ginosicecream.com but it doesn’t seem to exist! If you search further on the facebook page it will bring you to www.ginosgelato.com … at last... however, the flavours link isn’t working – one break is all I ask for! Lol! So the temporary verdict is two amazing Dairy free flavours based on the fact that they are both made with soya and my dairy free sister did not experience a reaction. I have emailed the company and hope to get a solid answer in return and, of course, I will update you as soon as possible! If you remember, I SERIOUSLY liked Jason Vale’s Veggie Juice in a Bar. Despite my initial reservations I found myself visiting the Hopsack, in Rathmines, repeatedly, for no reason other than getting another Veggie Juice Bar! I love the little dairy free, gluten free, vegan food allergy friendly super food bar... And then disaster struck... they ran out and didn’t seem to be restocking – Aghast! I think the actual problem was temporary and supplier related but whatever the reason I definitely felt the void. Meanwhile, back at the ranch, I was following some Gut healing books such as ‘Gut Reaction ’ and ‘Good Gut Healing ’ which were making me think about my recent additional food allergies and my overall health outside of just eating ‘free from’, and the potential source of my problems. I began to make small changes to the way I eat and what I eat. I wanted to introduce some form of Green Energy foods into my daily diet, now that I wasn’t getting my little ‘hit’ in the Veggie bars. I had tried 100% Spirulina in the past but found it hard to take outside of an elaborate smoothie to mask the taste and ‘slipperiness’ but I was hopeful of finding my perfect companion because my taste for ‘green’ had definitely matured in recent months. After doing some research and seeking some advice on different products I opted for Pukka’s Clean Greens supplement in powder form. I liked the variety of greens, the added peppermint, fennel and ginger to aid digestion and the lack of any sweetener, including Stevia which seemed to pop up in most of the brands I was looking at (I have nothing against Stevia except that I personally dislike the flavour and don’t think that the inclusion is necessary). Much to my surprise I actually LOVE the taste of the Clean Greens. I love it so much that I haven’t even tried mixing it with water yet because I keep licking it right off of the spoon! F. says that its tastes like soup… or more specifically, a stock cube. I prefer to describe it as peppery! The major bonus is that they turned out to be super easy to make. The only problem was that my daily dose of Clean Greens were in two balls but I found it hard to stay out of the box! 3. Chop the flaked almonds into small ‘nibs’ and roll each ball firmly into the nuts to coat evenly. And that’s it! Two balls give you a daily serving of Clean Greens and they make a perfect treat when you’re hankering for something sweet. Database Administrator by day, Science-Fiction Writer by night! On a more realistic note, Peadar works part-time for a large computer company and has published two books, The Inferior (2007) and The Deserter (2011) which have had international success. 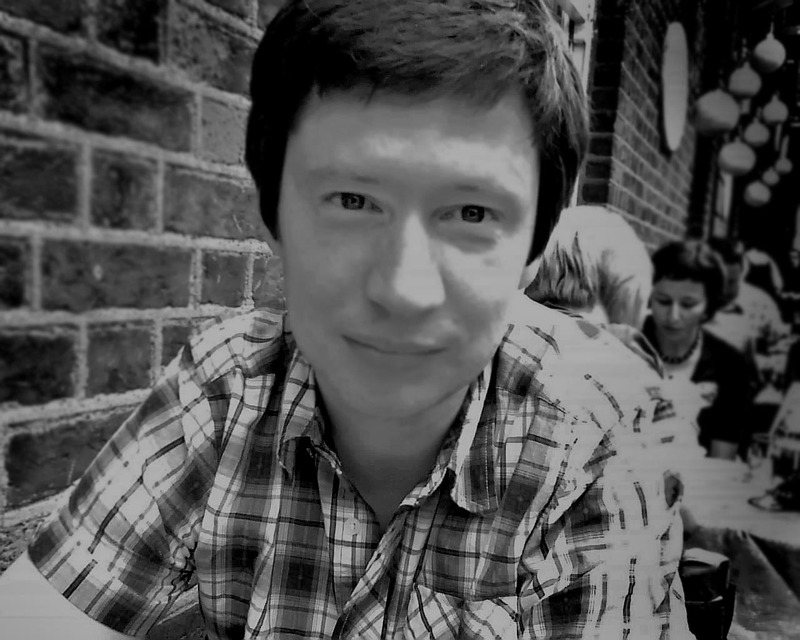 Peadar is currently working on his third book which will complete the trilogy. When he’s not fixing giant computers or writing he is singing in the kitchen while chopping onions! What are you allergic/intolerant to? I am intolerant to all kinds of dairy products. Short-term reactions include indigestion and IBS [Irritable Bowel Syndrome]. In the longer term, I tend to get arthritis, psoriasis and headaches. How long have you had, or have known about your food allergies/intolerances? I've been suffering from some of the symptoms for years, but I ignored them. Indigestion is unpleasant, but when you see a million ads for Rennies etc. on TV, the tendency is to think of tummy troubles as a natural part of life that affects everybody sooner or later. However, over years, the indigestion worsened and acquired a few friends along the way. By the time I was in my mid-thirties (early forties now), I was on various medications to control it and suffering attacks of IBS after nearly every meal. Even then, I thought it was all somehow “normal”. Around the same time, minor aches started affecting my joints. Two years ago, these aches rapidly got worse, to the point where I could barely walk and couldn't even cross my legs. At that point, I became afraid I would soon lose the ability to walk. How did you discover your sensitivities, or what prompted the diagnosis? Like a lot of people in my position, I tried to get help from several doctors. I had my blood and my stomach and my colon checked out, but nothing showed up in the tests. It was very frustrating and at no point did anybody suggest to me that it might be something I was eating. So, of course, I turned to the internet, where an army of crackpots is always waiting to fill the medical void with their theories. In the end, I tried the York Test. It's a blood test that searches for anti-bodes to various food proteins. I wasn't 100% convinced by the science behind it (and still amn't! ), but when it came back with dairy as by far and away the worst culprit, I decided to give it three months to see how I got on. My symptoms didn't clear up immediately, but I kept a thorough diary of everything I ate and how I was feeling from day to day. By the end of the trial period, there had been very noticeable improvements. After six months, my IBS was gone, indigestion was rare – as opposed to a constant companion – and the arthritis had lessened to the point where I could play football again. Do you find it difficult to stick to your diet? And if so why? No. My only difficulties occur when I eat out. That was, and continues to be very hard. However, if you're sick enough, you can stay off anything! What do your friends and/or family think of your food allergies or how do they deal with them? Everybody has been very supportive. One of my family members has a lot of the same symptoms I had and has followed me into Undairyville. It worked out really well for her too, I'm happy to say. Where is your favourite (food allergy friendly) place to eat? Cornucopia is brilliant[Ed. note: Yes it is!! & it's located on Wicklow St, Dublin 2]. I love it. Do you or have you ever broken your diet? I don't break it on purpose, but accidents do happen to people like me who like to eat out. It's usually no more serious than a bit of indigestion. As I said before, my short-term symptoms tend to be mild. It's the build-up that I fear and I haven't allowed that to happen again. Yet. Have you learnt anything about yourself since abstaining from your problem/danger foods? Just what everybody learns: the things I thought I needed... I really didn't. If you could give advice to people with food allergies or potential food allergies what would it be? Learn to enjoy cooking. Play some nice music while you do it. Sing along. Chop some onions. What is the best source of information and/or help that you have found? - I enjoy this site, of course! [Ed. note: Thanks!! ]I also use the HappyCow website to find vegan restaurants and they have a handy application for android phones that will search near you for safe places to eat. - The Cornucopia Cookbook is wonderful. - I also love wandering around the Asia Market in Dublin looking for inspiration. There's always something new – amazing or disgusting, you won't know 'til you've tried it. Can you share with us one of your worst, best and/or funniest experiences living with food allergies? I only wish I had a funny story to recount! Mostly, I bore the living daylights out of people whenever talk of eating comes up, or health, or cakes. The foodstuff is bad enough, but it would be a great idea if I also gave up talking about dairy. Would you like to share a quick and easy food allergy-friendly recipe?! I’d love to hear from you either way! And enjoy the rest of your weekend – come on sun! How to Cook for Food Allergies goes far beyond the expected. Lucinda Bruce-Gardyne is a professionally trained chef, a culinary teacher and owner of a catering business. She is also the mother of two food allergic children and a third who can eat anything which means that she is an expert in cross-contamination and substitution… Not to mention being the creator of the infamous ‘Genius Fresh Gluten Free Bread’. I have had the book out on loan from the library for months and months, with renewal after renewal. This is not because it’s massive or because I’ve been pouring over it every evening and just can’t give it up… it’s because I haven’t had a proper chance to look at it yet. I mean, I’ve flipped through it from time to time but have never tried making anything out of it and in general have always gotten just a bit overwhelmed by the amount of information and all of the substitution alternatives. I’m telling you this because I don’t want you to cast the book aside because at first glance it doesn’t wow your socks off or because the recipes seem a bit ordinary and the substitution alternatives aren’t clearly dedicated to your own specific food allergies and diet. 2nd there are tags in the left margin with possible substitutions underneath for i.e. gluten, dairy, egg, etc so you can choose how allergy friendly you wish to make the dish. 3rd there are often variations after the recipe for slightly similar dishes but with different flavours or different shapes such as Focaccia Bread or Pizza Bases based on the Gluten Free White Bread or Rhubarb Crumble instead of the Apple & Blackberry Crumble. At first, the system seemed confusing but once I adjusted to it I found it to be one of the best systems ever! Some allergy friendly cookbooks and recipes can be frustrating if you are, for example, dairy free and egg free but not gluten free and you’re trying to make a Victoria Sponge Cake (pg. 172!) because you don’t need to lose out on the gluten aspect but you still need an allergy-friendly recipe to help you! Likewise, many free-from recipes weigh heavily on another common allergen to pump up the taste. For instance, I regularly find that many gluten free recipes have loads of dairy products which can make substitution very difficult to navigate for a dairy free and gluten free diet. SO, like I said, best system ever! If only every allergy-friendly cookbook was written like this! –or just every recipe book ever... one can dream, no? Not to mention the recipe chapters on 'Stock, Soups & Sauces', 'Frying', 'Grilling' 'Roasting & Oven-Baking', 'Poaching & Stewing', 'Potatoes', 'Grains, Rice & Pasta', 'Home Baking', 'Puddings & Sweet Sauces', 'Baby Foods' and 'Children's Party Foods'. Each chapter goes into wonderfully helpful detail on topics like how to deal with Visiting Friends and Family, Choosing from a Menu, Travelling on Planes, What your Food Allergens are Used For in Different Recipes, and Substitution Ideas for each use. There are loads of information boxes throughout the recipe section and there is also a wonderfully in-depth chapter on balancing your diet and maintaining nutrition, vitamins and minerals if you cut out dairy, egg, wholegrain wheat, white wheat flour, soya and/or nuts. It tells you what you might be missing, what the missing vitamin, etc, does for you (why you need it) and where else you can get it. I genuinely believe that ‘How to Cook for Food Allergies’ does what it says on the tin: it helps you to ‘Understand Ingredients, Adapt Recipes with Confidence and Cook for an Exciting Allergy-Free Diet’. Whether you like the recipes inside or not, it is an essential guide for your food substitution journey. It will help you adapt all of your favourite family recipes from years gone by and it is an amazing aid to creating and developing your own original recipes. I’m being so positive about this book I almost feel like I’ve been paid to promote it, but I promise you I haven’t. All of my reviews are my own personal opinions and if that ever changes I will let you know loud and clear! I haven’t had a milkshake in over 5 years but in the interest of ‘research’ ;) I tried out one of ShakeAway’s Vegan monstrosities. If I had it over again I probably would have gone for Ginger Nut with added Wheatgerm but hey, the bright colours, loud music and the tweenies all around me hazed my judgment leading me falsely towards a Pineapple selection! What are milkshakes? I have often felt left out when people go to Eddie Rockets and have milkshakes (F being a prime suspect!). It’s always one of my poor-me moments because in my head I think that I love them so much and am really missing out. So even though I’m deferring on sugar right now I skipped on into ShakeAway to indulge my childish desires! To my surprise my taste buds reminded me, within seconds, that Milkshakes are very similar to melted ice cream – something that I’m not a fan of. Not to mention the copious amount of sugar! 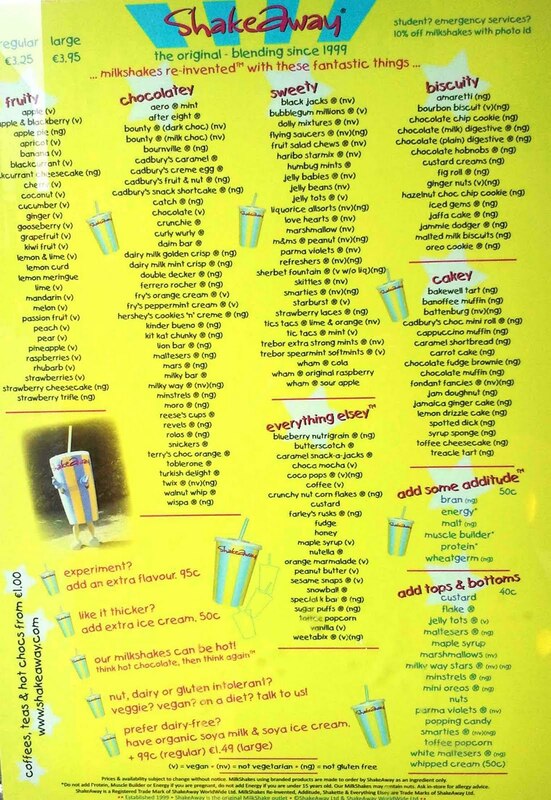 This aside, I was also disappointed that there didn’t seem to actually be any pineapple in my milkshake – woe... But on the plus plus plus side F tried it and said that it was very ‘milky’ tasting and that he wouldn’t necessarily know that it was vegan. In addition to that, he also thought that the 'pineapple' flavouring was trés artificial which was a pity. (UPDATE: ShakeAway just informed me on Twitter that they definitely use real pineapple in their milkshakes which is GREAT news! I suppose that it just tasted extra sugary to me because I have been off sugar for so long, which can often happen. But thanks ShakeAway for making your milkshakes that much less of a guilty pleasure for all the food allergy milkshake lovers out there!) On a purely vegetarian note, F got Nutella & Banana but mourned his favourite Vanilla. It's always hard to try something new when you know what you love! (v) is for vegan which includes dairy free and egg free with 40 flavours for dairy free and/or vegan diets ranging from fry’s orange cream, maple syrup, sesame snaps, ginger nuts, apricot, tic tac mint, weetabix or good old trusty vanilla! 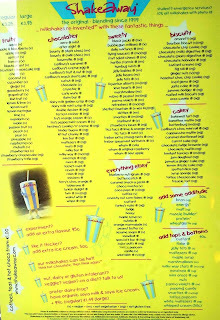 (ng) is for NOT gluten free – all bar 79 shakes, mainly located in the ‘Biscuity’ and the ‘Cakey’ sections, understandably! It also says on the menu that if you are Nut free ‘talk to them’... there are, unfortunately, no listings on the menu to pre-guide you. Note: There is an added price for the dairy free shakes due to ‘the high cost of soya ice cream’ which is a very real reason. So far there is only one ShakeAway location in Dublin but it's centrally located. There is a new ShakeAway coming to Abu Dhabi (United Arab Emirates) in October (in the Al Wahda Mall) and the home of ShakeAway is in the United Kingdom which therefore features ShakeAway locations in 44 UK cities. There was also something about Australia on the website too but I can’t figure out if it’s still in Biz..
A great girl with a handy selection of multiple food allergies. Pippa has a lot of talent in the kitchen and creates some thoroughly inspiring recipes. Just yesterday there was Gluten free etc, etc, flatbread – Hello! My own abilities wavered (a lot) when I attempted a gluten free flatbread invention but these ones look the bomb! Pity the angles weren’t better but it’s still pretty neat to see the changes and the lack of changes! My favourite bits are the cars –so greeny blue and deliciously rounded :D and I also love the trees which look like they were planted fully grown! Not to mention the stunted growth of the trees across from the Four Courts – what happened?! 50 years and NO growth?? What’s been going on for the last 50 years down on the quays?!! This t-shirt reminds me of ‘Scott Pilgrim vs. The World’ – VEGAN POWERS! I Love it. Vegan & Gluten Free Waffles : www.greenveganliving.blogspot.com/2011/06/healthy-waffles-vegan-and-gluten-free.html Its been yeeeears since I had waffles.. Yum, Yum & Yum. Waffles should be part of everybody’s life – ‘gluten free’, ‘dairy free’, ‘egg free’ diets or ‘I-eat-everything’ diets… Waffles should be part of your personal constitution! Ciao for now, and have a great weekend! Let’s talk shop. If you live with food allergies then you probably know all about the time and energy that gets dedicated to label reading and ingredient analysis. The real trick of the trade comes with the Russian Roulette of gauging allergen warning statements. I’m no poker player but I do think that it’s essential to know the rules of the game before putting your money on the table. - Fish and products thereof, except: Fish Gelatine used for vitamin or carotenoid preparations; Fish Gelatine or Isinglass used as fining agent in beer and wine. - Nuts i.e. Almonds, Hazelnuts, Walnuts, Cashews, Pecan nuts, Brazil nuts, Pistachio nuts, Macadamia nuts and Queensland nuts, and products thereof, except: Nuts used for making distillates or ethyl alcohol of agricultural origin for spirit drinks and other alcoholic beverages. - Sulphur Dioxide and Sulphites at concentrations of more than 10mg/kg or 10mg/litre expressed as SO2. This means that ‘unintended’ ingredients which might come in contact with the food product through cross-contamination are not required to bare warnings but often do out of either generosity or self-protection of the manufacturer. However, these additional warnings can sometimes come across as vague and have been known to cause confusion. Contains...: This is the awesome food allergy warning. No matter what the ingredient list says or what you think it says, you can be sure that the culprit allergen is somewhere inside. Therefore, it is essential that you do not consume this product. May Contain...: This one causes the most confusion. It could really mean anything. I see this warning more as a ‘self-protection’ statement rather than being helpful. Fact is that the food substance in question might be present, albeit unintentionally, and it is therefore up to your own risk taking nature if you choose to consume the product or not. However, if I had severe allergic reactions to my problem foods I would definitely be steering clear because tests have most likely proven some percentage of risk. Produced on a Line that uses...: I interpret this warning as being highly likely to contain trace elements of the food allergen in question. It’s like being allergic to milk and cooking in a pan which just fried butter but hasn’t been washed properly, if washed at all. I wouldn’t eat the food if I saw it happen in my kitchen. I see this as a big risk. Produced in a Factory that uses...: I interpret this warning as similar to ‘May Contain...’ It is impossible to know the true risk without being familiar with the factory. If you have severe allergies or extremely sensitive allergies which react to vapours and/or airborne particles I would avoid these products. Personally, I do frequently take chances on ‘Made in a Factory...’ warnings but I must stress that it is a personal choice that should be made according to the severity of your own reactions. Regardless of the interpreted definition of the warning statements above it is extremely important to remember the intended purpose of the warning: Whether your food allergies are severe or not there is definitely going to be a chance that the allergen in question will be present in the product. After that it is solely up to you, the consumer, to decide if you want to take the gamble. Note: if you are presently in the middle of an elimination diet I would strongly advise avoiding any product which might contain the substance you are eliminating in any shape or form of warning until you have completed the elimination and re-introduction process. This information is not intended to be a substitute for professional medical advice or for the care that you receive from your doctor or other health professionals. Greystones’ ‘The Happy Pear’: Vegetarian, Allergy Friendly Food with No Guilt! If you’re venturing out to the southern end of the dart line then make sure to call into The Happy Pear for a casual bite to eat. It’s a vegetarian feast with seating both inside (upstairs) and outside in front of the café, beside the food store. You might be familiar with The Happy Pear brand as they stock a few of the health food stores and green grocers in town. One of their most popular products are Sprouted Lentils and Mung Beans for €2. When I think of the Happy Pear, I think, Vegetarian, Happy, Bright, Wholesome and Hippy! From the Horses mouth: The Happy Pear believes in creating: Happier, healthier and more sustainable communities that support the local economy. The menu rotates daily but it always includes salads, soups, main courses and sweets. For possible menu items look on their website here. Note: there are also dairy free, sugar free raw vegan sweets on offer! I did found it a bit difficult to navigate which foods were the food allergy friendly foods (especially with the salads and sweets) and what I personally could eat, but the staff did their best to guide me through what was on offer which was very helpful. I was also a bit surprised at their unbending pricing system (I could only have the carrot salad due to my unusual and frustrating amount of foods that I am currently avoiding. So, I took some salad – one can only eat so much carrot salad – some hummus and two slices of dairy free bread. But when I pleasantly suggested that they might not charge me the full amount for a small plate of salad seeing as I only had half the plate filled they suggested that I fill up more. This was a pity, especially as they even charged the additional price for the two slices of bread on top of my extra small salad but I suppose prices are prices). ...Or even on cold wet days, take your food upstairs and sit beside the fire! Also, lest we forget, in addition to the food store, cafe, and catering business, The Happy Pear also has a famous Juice and Smoothie bar which serves vegetable, fruit and wheatgrass mixtures. Note: cross contamination may be an issue, especially with the sometimes self serve salads and bread) –although I should say that the bread was fabulous! Before I decided who’s recipe I would go with I had a little search through all of the most recent Roasted Chickpea recipes I had seen for flavour and process ideas so I could do a little cross reference and decide on the most appetizing. - Markbittman’s recipe is the one that inspired my final product the most – I loved the idea of frying the garlic and garbanzo’s in the pan first and putting the lemon juice on towards the end- I LOVE lemon juice! - Kalynskitchen’s Moroccan spice mix and FamilyFreshCooking’s seasoning ideas really got me thinking about some spices and flavours but then I remembered that I was limited to what was in my cupboard – so ground galangal, ground turmeric and cinnamon it was! There was cayenne too but luckily I passed on it because they somehow managed to come out fairly spicy as was. 1. Heat a few tablespoons of extra virgin olive oil in a pan and mince 3 large cloves of garlic and sauté at a medium heat. 2. Add the drained, washed, dried, and de-skinned (just remove the loose skins) can of chickpeas, season with sea salt and freshly ground black pepper and fry gently stirring frequently for about 5 or so minutes. 1st toss after 5-7 minutes, season liberally with ground galangal, a little less ground turmeric and a light dusting of cinnamon, and a generous amount of sea salt and freshly ground black pepper. 2nd toss after another 7 or so minutes, season again as above and drizzle lemon juice all over. Return to the oven for another 5 – 10 minutes. Have you tried a different way that worked out Grrreat?! Do share! If you have a Diary allergy or are following a Dairy free diet you should have little trouble finding suitable chocolate to tame any cravings that might be gnawing away. Today’s post goes through even more Dairy free chocolates (For more options please see the folowing links: here; here, and here) – some dark, some replacing ‘milk chocolate’, some with soya, some without. There are Dairy free, Lactose free, Gluten Free, Wheat free, Corn free, Coconut free and Soya free options in today’s selection but some are for the straight and narrow food allergic and some are for the allergy warning gamblers! Note: Gambling on your food allergies is your own choice. I am not a dietician or a doctor, this blog contains only my personal opinions. Food allergies, and food allergy reactions are VERY personal and only you can decide if you want to gamble. I try to include as many allergies and perspectives as I can but I call it gambling to highlight that you are taking a chance. Personally I think that it should depend on the severity of your allergy, what your potential reactions might be (remembering that there can always be a wildcard) and most importantly what the warning actually says. A lot of products have recently included dubious warnings due to the new food law. I am completely grateful for the new warnings but also think that some products have worded their warnings to cover all angles out of fear. There are some products which I have eaten for years that never gave me a reaction but now contain ‘may contain’ warnings. Equally there are products, such as Bourbon Cream biscuits, which contain the same warnings but I have had too many once off reactions. I think a good rule of thumb (i.e: ONLY if your allergic reactions are not severe or anaphylactic) is say no to i.e: ‘made on a line which uses Diary, etc’ and proceed with caution, weighing up the pros and cons, if the warning reads i.e: ‘made in a factory that uses cow’s milk, etc’. But don’t worry I will always highlight if a warning is present so you can make your own fully informed decisions! The Irish owned Choices brand makes a lovely little chocolate. It’s smooth and tasty and is a good alternative to milk chocolate. The best Choices product I’ve tasted are the Caramels – they are AMAZINGly good so it is no surprise that the Choices Bars reside in yum-town too. I can usually find these and the Caramels in The Sweet Life (Georges Arcade) and Restore on Camden St.
One of the older kids on the block. Dairy free Rice Crackle Bar and the Buttons, from the same brand, are some of the older ‘Milk Chocolate’ substitutes on the Irish market. You can definitely find them in Down to Earth (Georges St) and some larger Tesco stores. I like the Rice Crackle bar. F. doesn’t but the one that he tasted was a bit stale, which was unusual. They come at a good price and have a good size. I think that they are a great Dairy free alternative for children especially because there’s something about them that seems a bit main stream. I can’t really expand on that because it’s just feeling I get... must be something about the size, the wrapper and the milky flavour. Ingredients: Cane Sugar, Cocoa Butter (19%), Soya Flour (19%), Cocoa Mass (10%), Crisped Rice (6%), Inulin, Emulsifier (Soya Lecithin, E746), Natural Flavouring. Dark chocolate with natural coffee flavour fondant cream centres. My Dairy free sister and her sweet-toothed manager bought these at Fallon & Byrne (there is a whole range of different flavours) and they scoffed them in one afternoon without leaving me even a bite! So all I have is the empty package and their reliable word that they tasted delicious! But if you want to hear it from me I can confim that the package did smell good! Ingredients: Sugar, Glucose Syrup, Cocoa Mass, Cocoa Butterm Flavourings; Flavouring: Natural Coffee; Emulsifier: Soya Lecithin; Invertase. Dark chocolate (35%) contains cocoa solids 55% minimum. A Christmas Tradition in our house! Yes, that is another empty package that I photographed but this time it was me who scoffed them all! Elizabeth Shaw come in two Dairy free flavours: Mint Crisp and Orange, and honestly both are the bee’s knees. I suppose if I was to choose a favourite I would go with the Mint but equally valid, my sister would go with the Orange! Ingredients: Sugar, Cocoa mass, Cocoa butter, Glucose syrup, invert sugar, emulsifier: Soya Lecithin, flavourings. Dark Chocolate contain: cocoa solids 45% minimum. If you were in Dublin this past weekend I have no doubt that you are a little browner than you were on Thursday. It was SO amazingly beautiful on Friday and Saturday. The sun was shining, people were smiling and the parks in the city were swarmed with sun bathers and worshippers, of the non-pagan variety! Personally I took the opportunity to cycle out to the Frida Kahlo and Diego Rivera exhibition in the Irish Museum of Modern Art which also included a visit to the perfect Royal Hospital Gardens and the Itsa@IMMA café which serves gluten free cakes. They are labeled as ‘Flourless’ and rumour has it that they taste pretty damn amazing. Flourless Chocolate Cake which looked like a large brownie in the shape of a cake! The staff was extremely helpful and friendly and actually got the full ingredient lists (which were surprisingly simple) so I could tell exactly what was contained in the delectable treats on display. There were also, of course, salads and hot dishes. There was a sign that read ‘Gluten Free Bagels stocked here’ and the hot dishes were labeled with Vegetarian (V) or Gluten Free (GF) markings where appropriate. The café is located in the basement of the Royal Hospital, which is a beautiful building to visit whether you are an art lover or not. You can take your tea up to the courtyard and sit out in the sun or enjoy it in the café itself. Then, an absolute must for every visit to IMMA, especially if the sun is shining, is to take a walk around the grounds and stroll through the magnificent formal gardens. I love IMMA and I really love that the cafe is coeliac aware, with a side of dairy free! I’m not much of a fan of Frida Kahlo but I love her life story and find her iconic status very interesting. Thus, I didn’t run to the exhibit but was actually quite intrigued to see that special something in some of the original works. The highlight for me were definitely the self portraits by Frida Kahlo in the 2nd room on the ground floor and the architectural photographs which display stunning technical ability by Frida’s father, Guillermo Kahlo, as well as the photographic colour portraits of Frida in New York by Nickolas Muray, both located in the basement of the exhibition space. The Frida and Diego exhibition is running until June 26 2011 and has an admission of €5.00 (concession: €3.00) but is free for under 18s, full-time students and free to all on Fridays. The main Museum is always free admission.